Jennifer Francyk, joined Family Practice Specialists as a Physician Assistant in May 2014. Her husband, David Francyk, D.O., has been with FPS since 2010. A Phoenix native, Jennifer was born at Good Samaritan Hospital and went to Shadow Mountain High School. She received her B.S. in Psychology at ASU and her Masters of Medical Science Physician Assistant Studies from Midwestern University in Glendale in 2008. 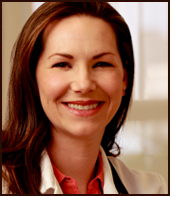 Her clinical interests include family medicine, women’s health, pediatrics, and osteopathic medicine. In addition to her work at Family Practice Specialists, Jennifer Francyk is a newly appointed adjunct faculty member with NAU’s Physician Assistant School, and is the president-elect of the Arizona State Association of Physician Assistants (ASAPA). She and her husband David have three young children, two boys, ages nine and four, and a two-year-old daughter, along with a 15-year old shih tzu/poodle mix named Trinity. One of her hobbies is taking Tae Kwan Do with her oldest son. Jennifer is a proponent of functional medicine: looking for and treating the underlying cause of disease, not just the symptoms. She loves working in family medicine and is pleased to be a new member of Family Practice Specialists.